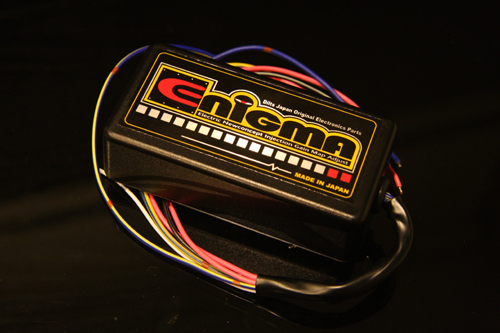 Enigma is fuel injection control subcon. Your iPhone or iPAD must have bluetooth4.0LE (iphone 4s later / 3rd generation iPAD later). 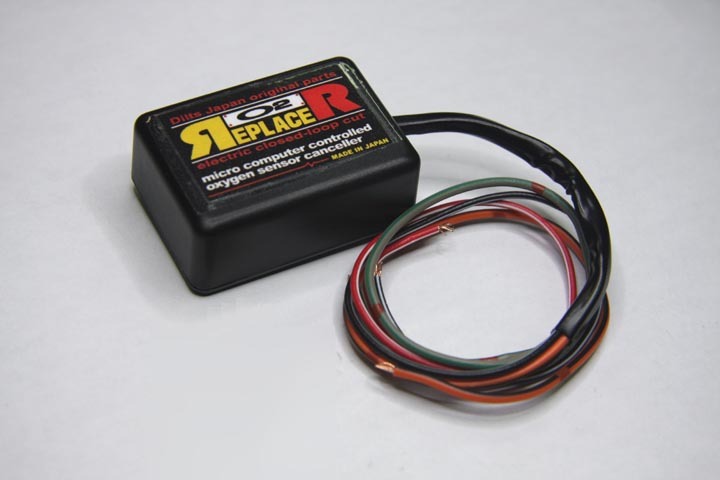 This product offers excellent performance by controlling injection ia an interrupt connection to a motorbike’s ECU. This has made it possible to change settings that until now were inaccessible. All controls can be used from a computer or a smartphone screen. Specialty ENIGMA operating windows software is available for free download from this company’s homepage. Dedicated IOS smartphone versions can be downloaded from the Apple Store and Android smartphone software is available from Google Play. (Please read descriptions on each screen carefully and take care to choose the right software) In addition, please note that there are PC, Android and IOS software versions available. Enigma don't cancel the spark cut limiter.If ignition limiter cancellation is necessary, please use the Enigma Fireplus. A smartphone or PC can be connected to the engine while running. Real-time information of the running engine will be displayed on the PC or smartphone screen. Current engine speed/throttle position are displayed in a box in the fuel map graph. These are individually illuminated so that areas for adjustment are easily identified. Making setting extremely easy. It is a twin limiter independent functions separate from the engine rev limiter rotation. I can control the PIT lane traveling speed, such as a circuit. Engine speed to be specified speed gear of your choice I enter in the ENIGMA. Their location or position does not your favorite, such as switches that are commercially available, of ENIGMA And as an external switch connected to the wiring, to suppress the speed by controlling the rotation of the engine specified only when "ON". It is possible to set the upper limit of engine speeds. This function is independent from the rev limiter, so it can be set even at low RPMs. This function can be used in situations where an engine speed increase is unwanted, such as during rev tuning measures or breaking in operations. This product reads the TPS signal, monitoring　the speed of the accelerator opening. Such as when the accelerator is opened quickly it determines that the rider wants quick acceleration. At the moment the accelerator is opened, fuel injection is increased asynchronously with acceleration enrichment, unlike that of the standard fuel injection settings. It can be set to work in the same way as a racing cab's accelerator pump. The dedicated PC / Smartphone software has a real-time monitor function. The throttle opening graph display and tachometer display are very convenient for setting up. The TPS opening monitor and tachometer work in real time while the engine is running. A smartphone can be used as a Tachometer for vehicles without a tachometer. TPS sensor output (usually between 0.8v ~ 4.2v) differs depending on the bike. This can be checked on a computer/smartphone screen so that the ENIGMA can be calibrated to the machine it is being used with. By correcting the input signal error the bikes accelerator position is accurately reflected by the bike. The numerical data of a custom fuel MAP is accurately reflected in the bike. Because ENIGMA (Bluetooth version) transmits data wirelessly, the onboard safety device allows wireless data to be transmitted only when the "Full throttle" key is set to "ON". This is done in order to prevent malicious third party access. If started with the normal "ON" key, wireless data won't be transmitted and third parties won't be able to access your ENIGMA. (The FI lamp will only flash when wireless data is being transmitted) Also when the ENIGMA is transmitting wireless data it can only connect to one machine. Even when you transmit ENIGMA information wirelessly (Such as when using the tachometer function will riding) a third party cannot access this information. In the case that changes are made to normal data, if the key is turned OFF and then turned ON while holding the throttle, wireless transmission will cease. It is manufactured to safely secure your data. The digital output has a service line. One revolution is one 5 volt pulse. It will support most commercially available digital tachometers. Winding type ignition cords may display an incorrect number of rotations depending on how the cord is wound, but if our output line is used, the correct number of rotations will be displayed. This service line can transfer a variety of other information. This unit is waterproof for normal daily use. (It can withstand moderate rainfall) Do not submerge or spray intermittently with water. It is supposed to be attached to the periphery of a normal ECU. Also, please do not drop or expose to strong shocks. This can result in major failures and/or cause problems. WARNING ! ! Be sure to read. This product was manufactured for competition / racing use. You assume all responsibility from installation to use. We do not assume any responsibility whatsoever. Serious damage to the engine can occur when used incorrectly. We take no responsibility whatsoever for damages arising from the actions of third party installations and the like, other accidents, or the customer's willful or accidental misuse or error. We do not take any responsibility whatsoever for the collateral damage resulting from the use or inability to use this product. One’s ability to use a computer/windows, smartphone downloads and such have no relation to this product. The operation of smartphones or PC will vary depending on the model. Please ask the shop where you purchased our product or specialty stores for help in these matters. Please do not use this product if you do not know how to, or cannot do these things. (Please ask a specialty shop) Our instructions are written assuming the reader has the required knowledge and understanding to use this product. On understanding the explanations above, please read operation manual carefully and use this product correctly.